Transitional Eternity: Pause. Stop and Think-- The last 20 years during the reign of Goh Chok Tong and Lee Hsien Loong. Pause. Stop and Think-- The last 20 years during the reign of Goh Chok Tong and Lee Hsien Loong. Lee Hsien Loong is currently hailing ALL Singaporeans to envision our country for the next 20 years. However, before we embark on crafting a future blue print for even one more year ahead, we should also pause and reflect upon our housing, transport and healthcare, the basic goods which impact on our standards of living. Goh Chok Tong’s “The Next Lap”, initiated in 1991, was too, a forward-looking plan for Singapore stretching as far as 20 to 30 years ahead. Between 1991 and now, have our lives improved or deteriorated in the last two decades? A vision without actualization is empty and meaningless. Strip off the number of hubs, rankings or international awards that Singapore has clinched throughout the years and get down to the core, ie, the quality of living. The best international airline award may polish our vanity and pride, but is of no relevance to the quality of our housing, (daily) transport and healthcare. Economic perspective first, since that has always been the benchmark for measuring the success of the governance of Singapore. GDP figures have always been the big and only picture of Singapore’s success story. 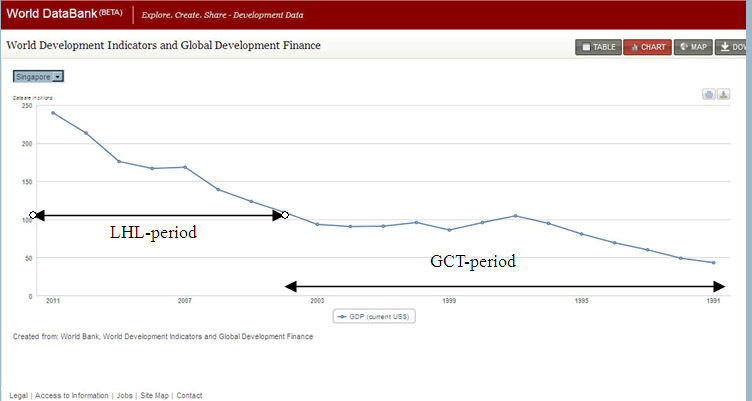 Looking at Singapore’s progress through the lens of GDP, the big picture is rosy-looking, with GDP growth on the upward trend throughout the last two decades. There are occasional dips of recession but the period of upward growth surpasses the dips. Our GDP per capita attainment was listed as the world’s most affluent country in 2010 by the World Report 2012. In fact, according to Goh Chok Tong, we have already attained the 1984 Swiss standard of living as early as 1994 in terms of GDP per capita in purchasing power parity. That was unmistakably Goh’s pride during his reign. It is also interesting to note that the pace of GDP growth is more pronounced after 2005 where it overtook the peak of GDP in the 90s. What attributes to such substantial growth of GDP in the mid 2000s? 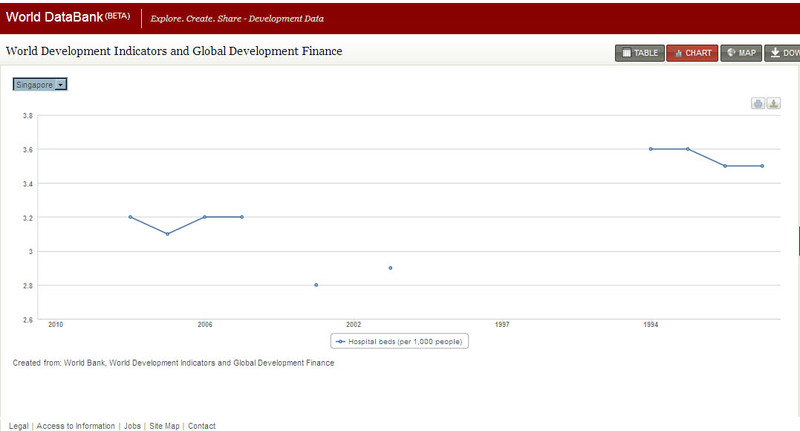 Compare the GDP chart with our population chart which may hold the answer. Coincidentally, the growth trend is very similar. Undeniably, our GDP per capita figures cannot achieve the same stunning figures independent of the population boost. There is a co-relation between the two. Another thing to note on our population growth is that it is growing at an accelerated rate after 2003. It took 13 years in the 90s to grow one whole million people (it reached 4.1 million in 2001 but hovered at this figure till 2003). After 2003, the population expanded by 1 million by 2011, within 9 years. Today, it stands at 5.3 million and certainly will be gushing through the 6 million mark, judging at all the hints that the Cabinet dropped all over the place on the need to grow population. 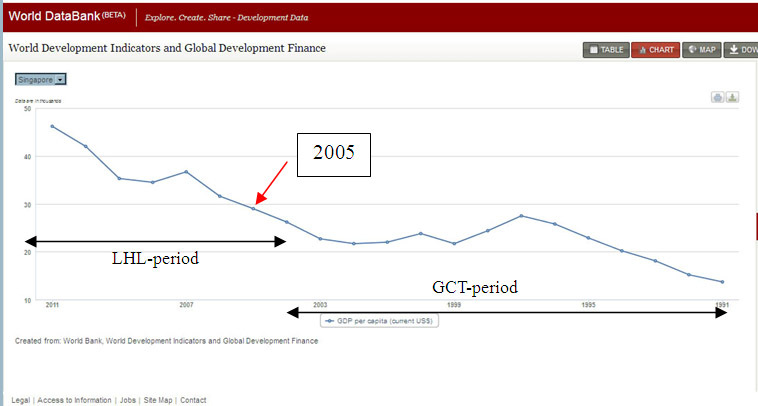 By the way, LHL succeeded GCT in 2004. 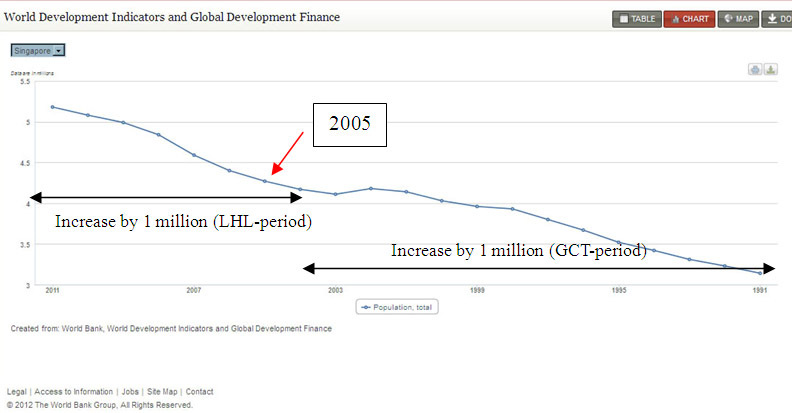 Lee’s GDP figures are also noticeably unmatchable by GCT’s, and likewise on his population growth rate. His addiction on the population size is apparent. Using population size as the single means to boost GDP begets the question of sustainability. Once the population expansion steroids are removed from the economy, what other miracles can LHL perform apart from importing another 5 million newcomers to elevate the GDP amount to 100 billion US dollars. Even if that 5 million more comes in, but the million dollar question is, what comes after? Another 6 million or so? Contrasting the limelight which our GDP figures has drawn, our housing concerns attract equal attention, albeit negatively. HDB size has shrunk in absolute size across all flat-types. 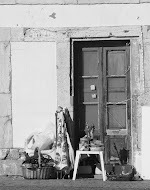 3- to 4-room flats shrunk by 5 sqm,whilst 5-room and executive flats shrunk by 15 sqm. To rub chilli into wounds, HDB price rose stubbornly throughout the last two decades and coupled with shrinking flat size, implying an even higher in terms of psf. Housing is the single most expensive purchase in our lifetime. Contrary to what Tharman suggested that inflation of HDB flats will not affect current flat owners. That is based on the assumption that all flat owners do not have any offsprings, or that couples stay married for the rest of their lives or there is never a compelling need to downgrade one’s current flat. Under current housing regulations, divorcees have to dispose of their flats. If for some reasons, they could not live with their parents under the same roof, they will have to turn to resale market for an abode of their own. 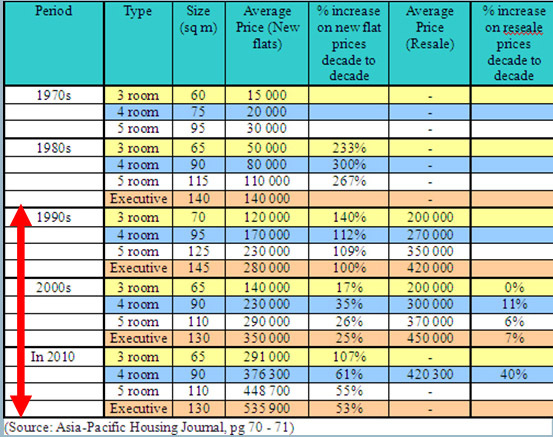 Prices of new HDB flats affect the resale market directly and vice versa too. And it is not rocket science to see future generations facing future HDB flats that are priced out of proportion of their incomes. In the event of such, current HDB owners may have to dip into their retirement funds to supplement their children’s housing purchases. Parents may choose to sell down. But with the unrelenting increase of HDB prices, selling down also means incurring higher purchasing price of a smaller and older resale flat, resulting in a fall in the quality of living. Paying more for smaller flats, median wage increase fails to catch up with the rate of housing price increase, extending the period of paying off housing debt and eroding both the retirement funds of both existing and future HDB owners. All these combined factors indicate a fall in overall living standard in the last two decades and outstrips any improved quality of new HDB flats there may be. To compensate better quality HDB flats with an additional 10-year loan is unreasonable. Contrary to what awards or accolades SMRT may choose to highlight in attempts to convince commuters of its service quality, as a MRT commuter since the 90s, the travelling experience for me has definitely fallen in comfort and reliability, both which constitute good travelling experience. Ironically, only the fare went up whilst comfort and reliability fell. Awards or rankings hold little meaning if actual train travelling on the ground fails to yield improved satisfaction despite persistent fare hike in the last two decades. Newer models of trains with greater seat spacing or improved comfort are completely written off by excessive overcrowdedness and longer waits to board a less sardine-packed trains during peak hours. How would newer model of trains improves commuting experience if commuters were compelled to wait for a few rounds of trains during peak hours before they can squeeze on board? Longer waits translate into longer commuting time between home and workplace, leaving home earlier and returning home even later. Commuters expect crowds during peak hours but public transport operators are being unreasonable to pack commuters to the extreme of a can of sardines. To be perspiring in the supposedly air-conditioned train carriage, not forgetting to mention that the increased number of bodies packed in a constraint cabin will inevitably and understandably intensify the body odours after a day’s work, it is also inevitably uncomfortable. The insufficient air-conditioning in the cabin is an indication of overloading. And comparing to the crowds at peak hours in Tokyo does not even make me feel any slighter comfortable on my train trips. Instead, such comparison attempts to belittle my genuine travelling discomfort irks me to the extreme. By the way, I hate London tube and still that does not eradicate the fact of SMRT’s deteriorated quality since the 90s. Unreliability due to train stalls or signaling problems or what-so-ever has become part and parcel of our SMRT travelling experience. Just the other day, on the 29th October, around 7pm, commuters were disposed at Toa Payoh because of door faults. The faulty train then pulled out of the station with no further instructions whether stranded commuters should find alternative travelling mode or to wait for subsequent trains. So much for improved communications after the massive break-down last year. Although the data for the number of hospital beds per 1000 people is incomplete throughout the last two decades (world bank date), one could still see that there were more hospital beds between 1991 to 1994 as compared to the period between 2005 and 2008. It is a consequence of unprepared population expansion, leading to longer wait for outpatient healthcare. That is a fall in quality of healthcare. On the other hand, whilst ministers are urging for wage increase in tantrum with increased productivity, yet our expenditure on healthcare does not increase in tantrum with the GDP growth. 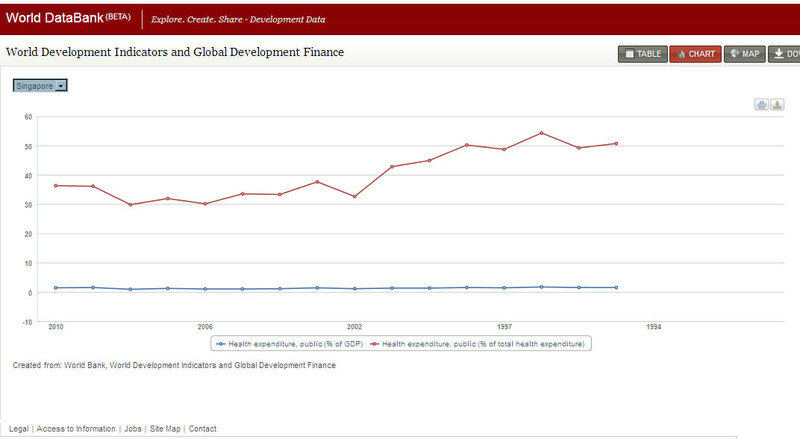 Proportion of public expenditure on health care is comparatively stable compared to private expenditure. With rate of inflation, this is hardly good news as public expenditure is actually decreasing in real terms. Its size of spending that caters to the majority of the citizens surprisingly lags behind private spending, and bearing in mind too that our public spending is even below that of developing countries, an evident indication of a strong reluctance to distribute GDP yields to the majority of the citizens. And with our accelerated population expansion rate since 2005, public health expenditure fails to rise in tantrum too. A glance through the reality of our housing, transport and healthcare, has GCT’s 1991-vision improved our lives? If the answer is not affirmative, it is already a proven record that Singapore’s politicians-in-power have failed to effect genuine and beneficial progress for the bulk of our citizens despite their vision, planning and promise. Therefore the attempt to think beyond tomorrow with the same political party of unchanged ethos, values and mindset is futile, save the envisioning. We did surpass the Swiss standard of GDP ultimately, yet our quality of lives for the majority of our citizens is worse off than the 90s. And that is the proven record of PAP’s failure.